Network Fun!!! -- A Security/Network Engineer's Blog: ShoreTel and the Algo 8180 SIP ringer. Anyone heard of the Algo 8180 SIP ringer? Well, its kind of a neat device if you have a hard time hearing a phone ringing. In my example, I have a manufacturing facility where there is one phone in particular that has a lot of noise around it. So, when a call comes, its very difficult for them to hear the phone. With the Algo 8180 SIP device, it will ring an electronic tone out pretty loudly so that they can hear when the phone rings. Its pretty nifty. By the way, Im integrating this with the ShoreTel phone system, version 12.1. So, here is what I did to set this up. I put the Algo 8180 on the voice network and it got a DHCP address. I found that address and then I put a static IP address on it through the web interface. Its pretty easy. You find the network area and set it to be DHCP off. 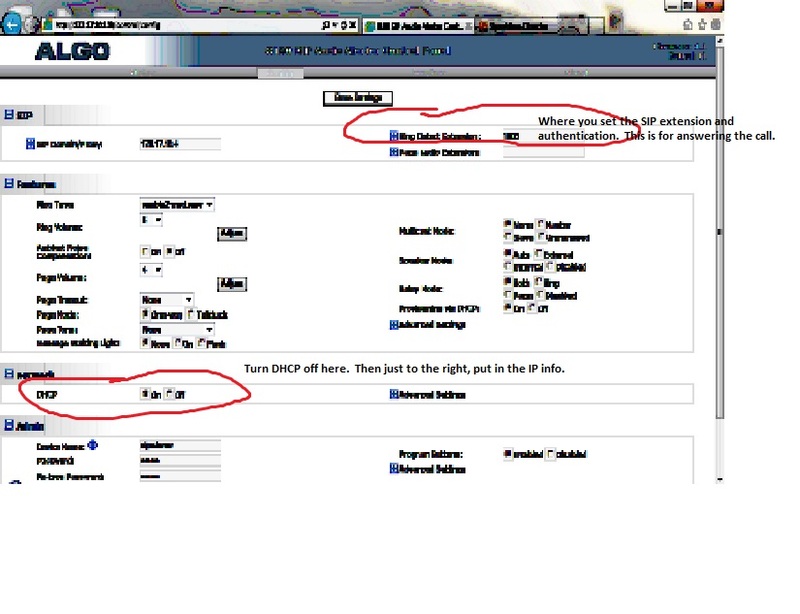 Then you are allowed to put in the static IP, subnet mask and gateway. Save that and it will want to reboot. You can go ahead and put the SIP settings in also. See a screenshot of the web interface of the Algo 8180. Im somewhat of a fan of this device in this environment. So, on the ShoreTel side, here is what I did. Keep in mind that there are several ways to do this. First, I went to IP phones and registered the SIP device. Once you enter that info and save it, you can go to the bottom of the page and see if it registered. If it did, great. Go to the users page and add a user. Put in the extension you want it to be. Make it an extension only, no mailbox. Go to the IP phones and select the SIP phone you just got registered. Then go the bottom and put in the SIP authentication. Oh, make sure the username matches the same as what you put as the name of the Algo 8180. I used "sipalerter". Next, go and create a hunt group. Put in the extension of the Algo 8180 and the phone you want it to ring with. If the user extension was originally 6000, then I made the hunt group 6000 and gave the phone a different extension. So, the Algo and the phone on the manufacturing floor are in the hunt group. Make sure you make it ring "simultaneous", so that bot ring at the same time. That is all you have to do. Pretty simple.